I have been out of boating for 3+ years and I am ready to get back into it. I have owned a Sea Ray 330DA, a Regal 4080 Sedan Bridge, a Maxum 2400 SCR, and I did most of my own maintenance/service. So, I know boats pretty well. I know the whole Sea Ray, Maxum, Bayliner, which one is better stories/opinions, not really looking for info there. I actually know the boat, used to be slipped near it 4 years ago, never boarded it and never looked at it as a boat to buy. I alwasy liked the boat, though. Things change, times change, it's for sale and has piqued my interest. I've exchanged a few emails with the owner, now it's time to go see her. I've Googled the make and model, and, all looks pretty good. Glad to see you back. I slipped at SBH and have not seen that boat move in years. I would be concerned about the engines not being run. Maybe it's been cleaned up but she was filthy about 6 months ago. I don't know if twin 150's are going to get you the speed you are use to. I'm thinking maybe a 10 to 12 knot cruise and 18 top end. Just to give you a comparison, Chrissy Salyers 4588 gets the same numbers. Thanks Dave! None of that concerns me as I would get engine surveys, and, I am not afraid to get my hands dirty. The speed is about right too..my days of 25 mph+ are behind me! What does concern me is his comment in one email "not even sure we want to get out of boating", so not sure how much negotiating there is on this one. I would like to know more about engines. Are they 4BTA? if so that's good. Cummins got in bed with other makers for a while and sold some junk under the Cummins name. Thanks Bruce, if 4BTAs, is that good, or bad? She has not moved in 3 years, he states he runs the engines monthly for 30 mins. I just found out, no genny, though she is wired and configured for one. Not sure what that means; she had a genny and it was removed, or one was just never installed. Great to hear you're looking to get back into boating. Best of luck! the 4 BTA is a Cummins built engine block and very reliable and easy to get service. with that kind of horsepower will this boat even get on plane, or is the intention to run solely at displacement speeds? That HP in a boat that size and weight, I'm guessing to get the bow down so it will get up on plane is going to take LOTS of trim tab. Not that I think that is necessarily a bad thing if you are content to run basically at trawler speeds when cruising. Looks like a very nice boat. 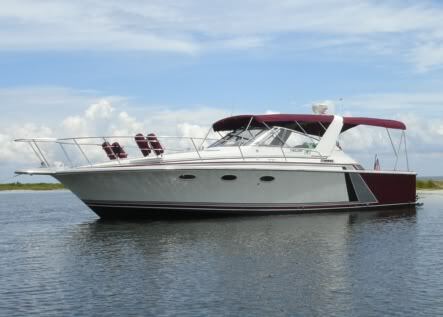 This is one of the Bayliner models I like. They will get on plane and cruise above hull speed. The Cummins 4BTA is very reliable. I think they are better engines than the Hino's that are found in many Bayliner models. twin 150 horse diesel on a boat that size will plane? Must be plenty of torque pushing the prop. My guess is that 150 horse gas engines would NOT do it. However Tony Athens over at boatdiesel says QUOTE "PROPELLERS MOVE BOATS, ENGINES ONLY TURN THEM"
That said I don't understand how twin 150's can adequately plane this boat, but I am a novice when it comes to such things.